Our summer club is a group of people from Worcester Badminton Club, who get together on a weekly basis to continue playing throughout the summer months (May - August). There is an additional weekly cost for this club as it is an extension to the regular season, and is therefore not covered by the annual joining fee. The Summer Club is primarily for adults (i.e. 16+) but sometimes strong older juniors who can hold a game with adults come. Our League Club players come for more relaxed gameplay out of season. Saturday Club players come to test themselves against stronger players from the league club. And we also welcome visitors and new players who might be looking to join us in the new season. So open to all really! It's not a coached or structured session, just turn up and play. 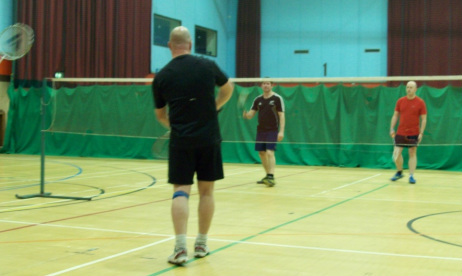 We play on Wednesday evenings (8.00-10.00pm) at Perdiswell Leisure Centre in Worcester using feather shuttles. Summer Club this year starts on Wednesday 14th May. Please Note: Anyone who joins the summer club will not automatically become a member of Worcester Badminton Club. If you are a member of Worcester Badminton Club you will be eligible to play at the summer club if you wish.